These famously pyrotechnic concertos, some of proto-Paganinian complexity, show a more public virtuosity than the interior spirituality of, say, Biber's Mystery Sonatas. Locatelli's own Sonatas - he wrote a number - certainly lack the Bohemian composer's sense of profound engagement but then Locatelli was writing from a different compositional axis; a broadly Corellian-Vivaldian one that took an admixture of Handel and larded it with moments of extreme, if (in our terms) rather static melodrama. And his Concertos are certainly chin-juttingly tough to play and have provided fiddle players with quite sufficient difficulties over the years. The fearsome few tend to dig out the solo sonatas - Ricci, Staryk, Kremer amongst them - whilst such as the pioneering Lautenbacher have given us complete sets of the concertos. Adopting elements of the church sonata he added finger busting double stops and exceptionally difficult writing in the soprano register, playing that tests agility, digital accuracy and intonation to the maximum. All the concertos contain caprice-cadenzas, moments when the soloist lets loose with a battery of florid cadential dramas � not for nothing was Locatelli known colloquially as The Earthquake. Slow movements are lyrically etched, such as the first in D major. Opening movements, as often as not Andantes, can move, as in the case of the C minor [No.2] with noblest of treads whereas Vivace finales can tend toward the vocalised and possess real lyric generosity, though there are dangers aplenty. In the finale of the F major Bonucci�s intonation is compromised somewhat and there are instances of strained passagework, though as elsewhere he remains elegant and generally unruffled by the exorbitant demands placed on him. Such things may seem schematic but Locatelli cannily varies texture and tone; the stratospheric finger board work in the concertante parts of the E major [No.4] are contrasted with the greater concentration on the lower strings in the powerhouse cadenza. And lest one think him a fl�neur, melodically speaking, he spins a haunting Largo in the same Concerto. He also manages to spice up a compositional trick whereby the spaced orchestral chordal introductions to the slow movement become, over time and as the concertos develop, quicker. The move generally is toward a greater concision of utterance and a greater compression of musical ideas, even if in the case of the Largo of No.11 it has become generic through overuse, and even though the last of the twelve, the G major Facilis aditus, difficilis exitus (an appropriate Latin tag), has an inordinately long but clever finale � the longest single movement of any of the concertos. 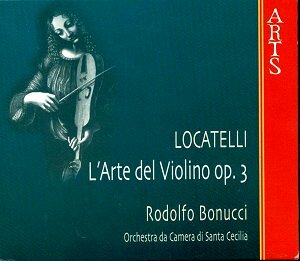 So Locatelli�s demands are well met in this recording. As I said intonation is not always spot-on but the cadential passages are taken with drive and not a little swagger, as they�re surely meant to be. The band can sound a mite thin from time to time and there were moments � I may be wrong � when the acoustic for the cadenzas seems to change (were these taken down separately or are they different takes?). But otherwise these performances do well by the quirks and formidable demands � the little scotch snaps, the Handelian cadences, the whistling harmonics, the fearsome double stopping, the vertiginous in alt playing. All are available singly but Arts has now brought them out in a slipcase. If you prefer to sample you should start with volumes two and four � plenty of variety.